Aldbury is a picturesque little village in Hertfordshire about 2 miles from Tring and sitting below Aldbury Common on Ashridge which forms part of the Chiltern Hills. 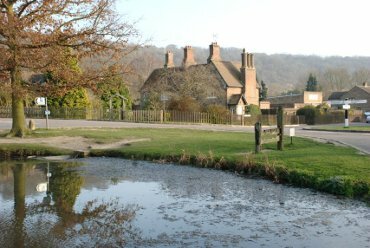 The village is clustered around the village pond and green which includes some old stocks with whipping post. The stocks were last used in 1835 to punish a drunken villager. 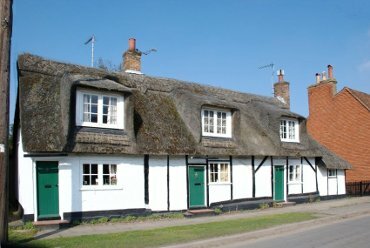 There are a number of fine old buildings both large and small in the village. This fine old timber-framed building with brick infill dates from the 17th century and is known as the Old Manor House. Some buildings in Aldbury, like this one, have brick 'Noggin' infill and others have wattle and daub. Bricks became commonly available at the beginning of the 17th century so this house could have been built with brick infill but the bricks could have replaced wattle and daub at a later date. This row of little terraced thatched cottages is to be found a little north of the village pond on Stocks Road - the road to Ivinghoe. 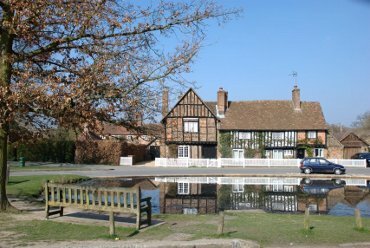 Albury was one of the locations used in Midsomer Murders, the television detective series, and appeared in 'Written in Blood'. 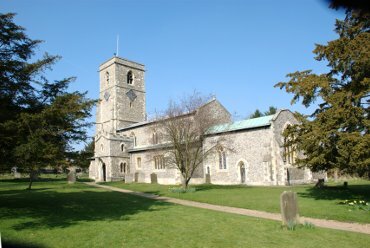 The earliest parts of the church of St. John the Baptist date from the 13th century and the tower was added during the 14th century. The Duke of Bridgewater Monument on the ridge above the village. This monument is open for only part of the year and normally only Saturdays and Sundays. 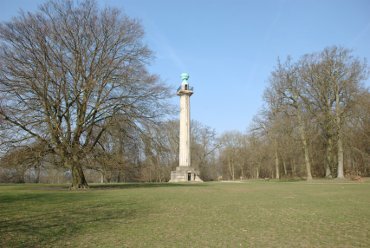 The very top of the Duke of Bridgewater Monument can be seen from Aldbury village poking above the trees on the ridge above. There is easy access by car to this area with lots of free parking. Lots of ancient woodland to walk in.